I’ve always loved tahini but only just recently began using it in sweet recipes. What in the world was I waiting for?! It’s so good! I think I might be a tiny bit addicted to the tahini + sweet combo now, so apologies in advance if I get carried away with tahini treats on the blog! 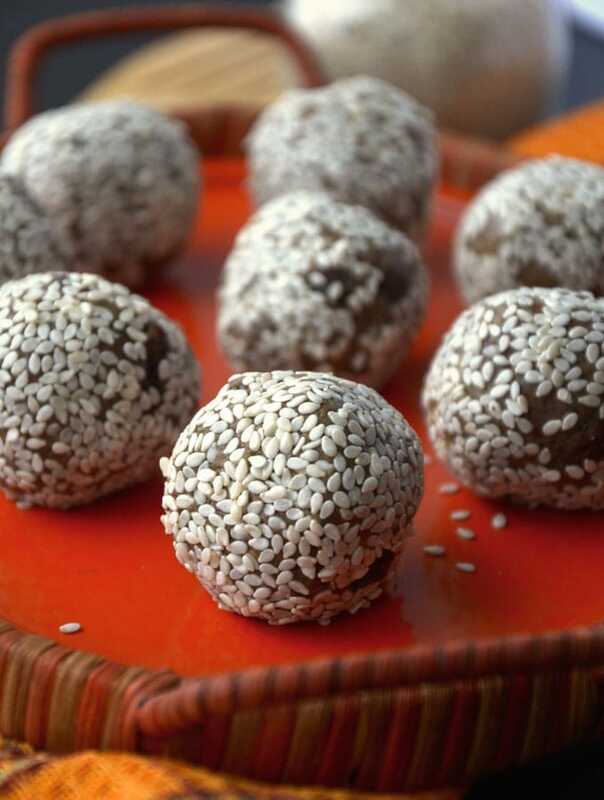 Made from ground sesame seeds, tahini is rich in minerals like phosphorus, potassium, magnesium, and iron. It’s also great source of calcium, high in vitamin E and B vitamins. It’s highly versatile and can be used in all sorts of recipes. I mainly use it in salad dressings, dips and sauces...until now that is. Hello Tahini Cups with Coffee Cream, I’ll be seeing you real soon. Tahini is also a great option if you can’t eat nuts. It’s similar to nut butter so it can replace peanut or almond butter in most recipes. Thanks to it’s high iron and calcium content it also makes a wonderful addition to a plant-based diet. 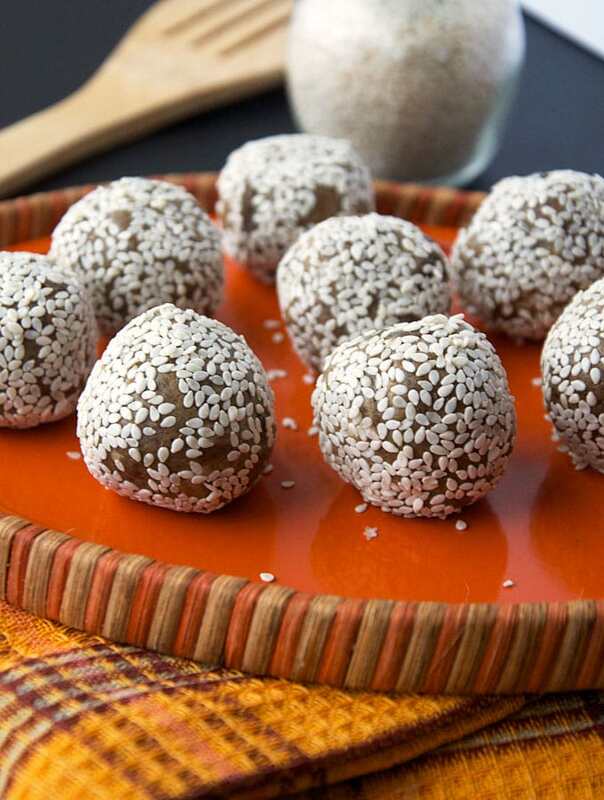 The reason these tahini protein balls came about is I’m currently blender-less so I couldn’t include nuts or dates. I know it’s time to get a Vitamix or Blendtec, as soon as I can wrap my mind around the price tag. I know it’s worth it but it’s still a good chunk of money! However, I use a blender in my kitchen at least once a day so I’ll have to get something soon. I’m getting by on my immersion blender and a small single-serving blender at the moment but they aren’t going to cut it much longer. 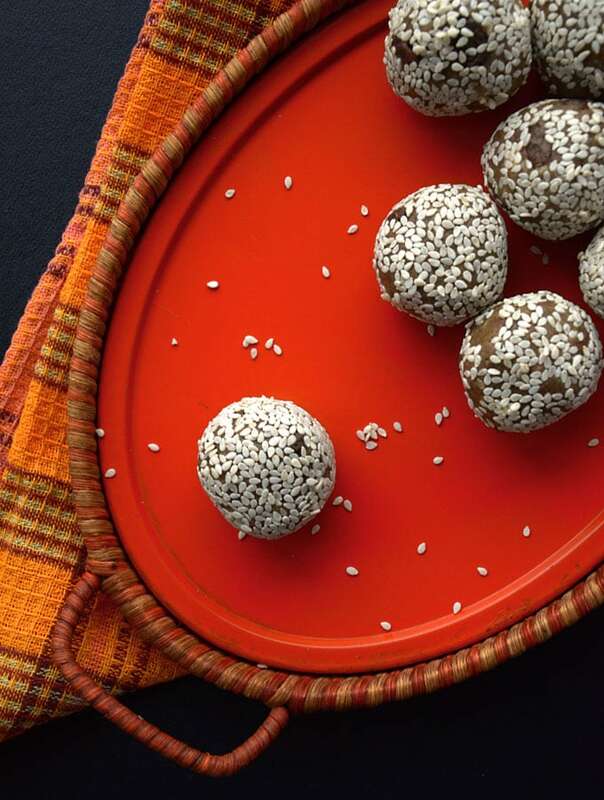 So, these Sweet Spiced Tahini Protein Balls? No blending required. Mix, roll, coat, eat. 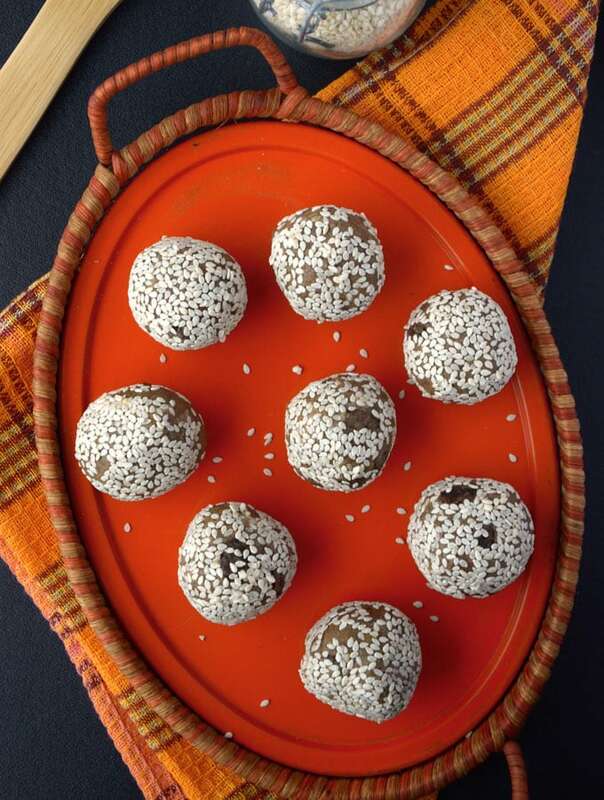 Yep, you’re only a few minutes away from all the sweet spiced deliciousness! Give ’em a try! I’m addicted to anything tahini! I’ve been going through jars like it’s my job! I love tahini! Delicious girl! Ah yes, sweet tahini. I’m not to the level of slathering it on toasts, but drizzling tahini and a pinch of coarse salt on an apple pie oatmeal? Heaven. Tahini+maple syrup is one of my FAVORITE combos! Try just those two things mixed together. I dare you! Seriously—you will die. The best apple dip of your life!! Great recipe! I like how simple it is and protein filled which will keep you satisfied longer without the blood sugar dropping. Perfect for on the go! Mmmm, they look so delicious! Can’t wait to try them! Would it be weird to sub NCN brown rice protein powder?